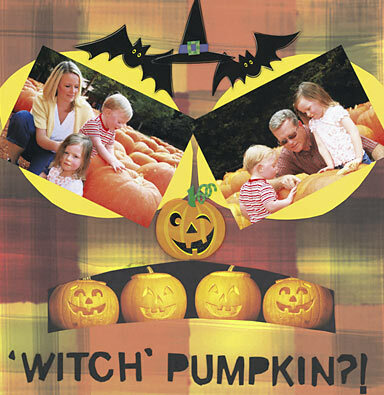 This pumpkin patch scrapbook layout features some of the largest pumpkins I've seen. Some of them could be converted into apartments. This is a frighteningly bad pun - in keeping with Halloween, I feel. I'm saying that really because I don't want you to think I can't spell. I called the layout this because hopefully you've seen my attempt at a witch's face. The paper I used for the witch's mouth is a paper that I thought about using as the background - but it was just TOO scary! It's called 'Carved Pumpkin' by Masterpiece Studio. For my background I settled on the more warm and 'friendly' design by Dovecraft. HALLOWEEN EMBELLISHMENTS - WHAT A BIG CHOICE! We're spoiled for choice when it comes to Halloween embellishments, aren't we? I showed a degree of restraint I feel, in just going for a little 'bat and hat' action up top with stick-ons from Sandylion. A great tool I discovered (after putting this layout together!) is a book by Jen Gormley called '500 Scrapbooking Sketches' , which has shown me how to use simple line drawn templates before starting the 'sticking down' phase. She's great at bringing templates to life and there's a good example of this if you scroll about half way down this page .